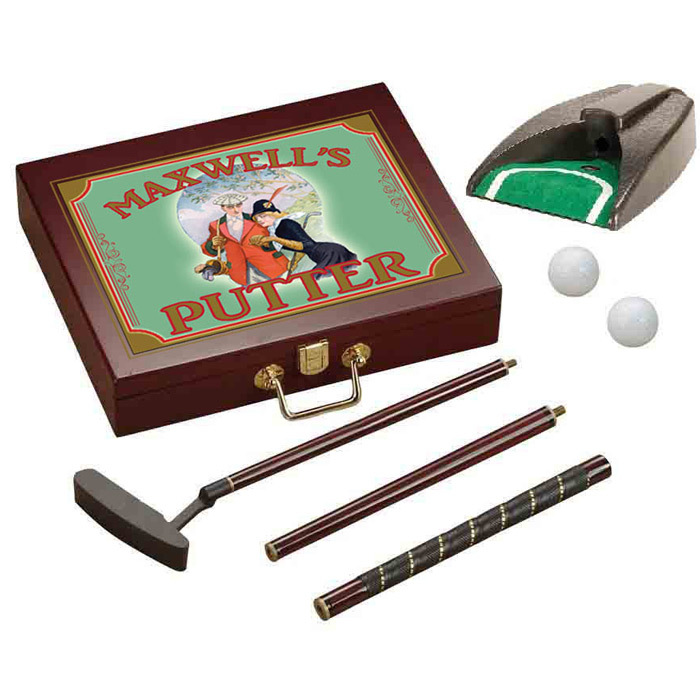 Here is the ultimate Executive Golf Gift Putter Set, a lovely heirloom rosewood gift box that includes a collapsible putter and automatic ball return target. Each gift set includes customization of the name of your choice, and with four design options available this is truly the ultimate executive golf gift putter set you’ll find anywhere. The heirloom gift box is solid wood with a rosewood finish, with brass-finished handles and latch to secure the contents. The top on the box can be personalized with one of four designs, each of which has an old-timey look and feel. 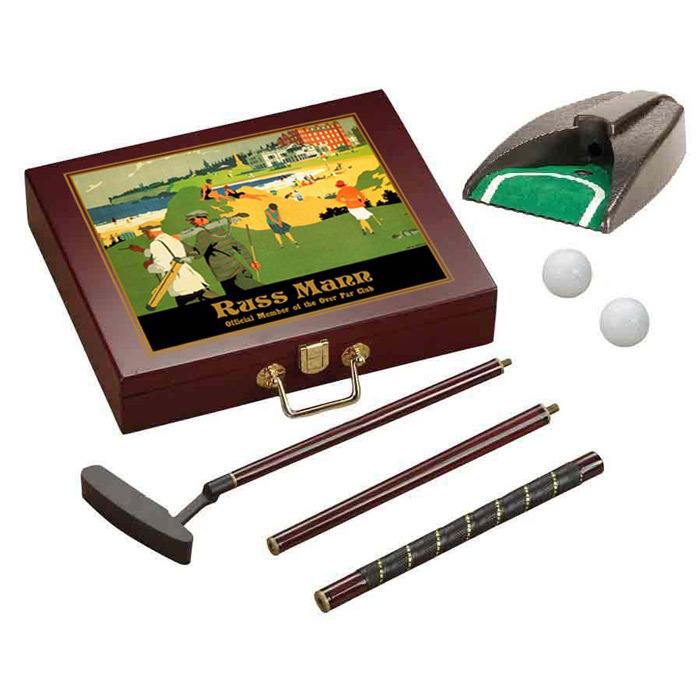 These designs accent the classic look of the rosewood gift box and make it the perfect heirloom gift idea for a golfer. 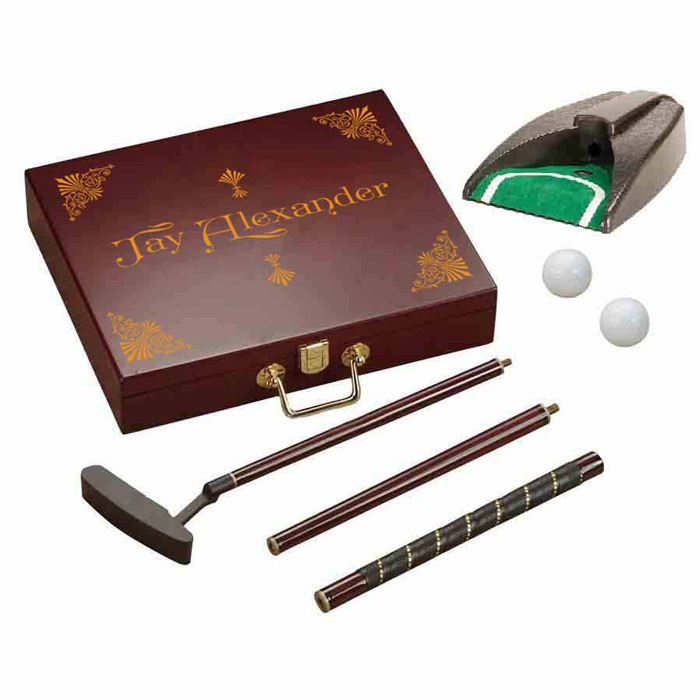 The inside of the Executive Golf Gift Set Box is lined with perfectly outlined foam, which keeps the golf gear secure and safe for travel and use in or out of the office. Each set includes a collapsible full-size putter in three easy-to-assemble pieces, along with two golf balls so you’ll be ready to practice anytime. Last but certainly not least is the automatic ball return, which serves as the putter’s target and will automatically shoot the golf ball right back to you. You’ll find the hours at the office quickly whittling by as you hone your short game to perfection. The 19th Hole design is perfect for the golf-themed man cave. We have more 19th Hole stuff available here. Each of these four artistic designs includes personalization of your name. The vintage-style “Country Club” also provides room for an optional second line, which you can use for a brief title, company name, or quote. Find your Ultimate Executive Golf Gift Putter Set here! Find yours here! Then, explore more great personalized golf gifts here.